The GPW sets 3 targets: to ensure that by 2023, 1 billion more people benefit from universal health coverage; 1 billion more people are better protected from health emergencies; and 1 billion more people enjoy better health and well-being. WHO estimates that achieving this “triple billion” target could save 29 million lives. Over the course of the second and third days of the Seventy-first World Health Assembly, the debate covered a wide range of health topics and European Region Member States were fully engaged in these discussions. A variety of technical briefings, side events and bilateral meetings also took place. 13th General Programme of Work. The greatest part of the discussion on 22–23 May focused on the proposed 13th GPW. Countries from across the European Region expressed robust support for this strategic plan, particularly highlighting that its vision aligns closely with and will support the achievement of the SDGs. Countries were united in their strong support for the universal health coverage (UHC) target, and many provided specific examples of how they have already introduced health reforms and policies that will move their respective countries towards UHC. Countries emphasized the importance of strengthening and transforming health systems, with a special focus on primary health care, and broadly acknowledged the value of developing equitable health systems that leave no one behind. Delegates did, however, note that WHO will need to make a number of strategic shifts in order to achieve the targets outlined in the GPW, specifically to step up its public health leadership, focus on impact in countries and ensure that people can access authoritative and strategic information on matters that affect health. European Region countries that commented on these days included: Albania, Belarus, Bulgaria (on behalf of the European Union), Czech Republic, Denmark, Estonia, Georgia, Greece, Iceland, Israel (on behalf of the South-eastern Europe Health Network (SEEHN)), Italy, Kazakhstan, Kyrgyzstan, Lithuania, Luxembourg, Malta, Monaco, Norway, Republic of Moldova, Romania, San Marino, Slovakia, Slovenia, Spain, Sweden, Turkey, Turkmenistan, Ukraine and Uzbekistan. Health, environment and climate change. More than 50 Member States and a dozen non-state actors addressed the topic of health, environment and climate change, expressing overwhelming support for WHO’s approach to tackling this significant health area. Countries acknowledged the importance of taking a multisectoral and population-based approach to environmental risk factors and many underscored that environment and health concerns should be included in national policies and strategies. Countries also highlighted the strong link between noncommunicable diseases (NCDs) and environmental factors, with some emphasizing that this link should be further strengthened. Countries expressed appreciation for the Road Map for an Enhanced Global Response to the Adverse Health Effects of Air Pollution, as well as for the upcoming global conference on air pollution in Geneva. From the European Region, countries that commented included: Austria, Azerbaijan, Bulgaria (on behalf of the European Union), Israel, Monaco, Netherlands, Norway, Russian Federation, Spain and Switzerland. Public health preparedness and response. Delegates to the World Health Assembly were briefed by Dr Peter Salama, WHO Deputy Director-General for Emergency Preparedness and Response, on the Ebola outbreak in the Democratic Republic of the Congo. He referred to the outbreak as being on the “epidemiological knife edge”, but praised partners and donors for helping to put in place a rapid response. Debate also began on public health preparedness, including a report from the Independent Oversight and Advisory Committee for the WHO Health Emergencies Programme. The committee said that over the last 2 years, the programme has demonstrated its importance in stopping the spread of infectious pathogens beyond national boundaries and leading the health response in numerous humanitarian crises. It noted, however, that further progress was still needed. Thus far, Belgium, Germany and the United Kingdom have made interventions on this agenda item, expressing their support – including financial – for WHO’s work in emergencies. Discussion is ongoing at the Assembly. Health conditions in the occupied Palestinian territory. 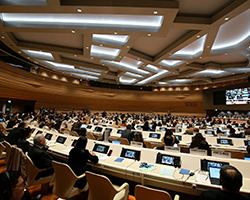 The World Health Assembly discussed the health conditions in the occupied Palestinian territory, including east Jerusalem and the occupied Syrian Golan. Delegates reaffirmed the need for full coverage of health services, recognizing that the acute shortage of financial and medical resources is jeopardizing access of the population to curative and preventive services. Addressing the global shortage of, and access to, medicines and vaccines. Countries recognized the pressing and worrying nature of the global shortage of medicines and vaccines, along with other issues related to access. They broadly welcomed the draft decision to request that WHO elaborate a 5-year roadmap to address access to medicines and vaccines, to be presented to the World Health Assembly in 2019. In particular, countries asked WHO to help facilitate the sharing of experiences and best practices related to improving access to medicines, and several countries highlighted the need to take a comprehensive approach that considers the entire pharmaceuticals value chain. Countries also emphasized that equitable access to affordable and high-quality medicines and vaccines is an essential component of UHC and an important target of the SDGs. European Region Member States that took the floor included: Austria, Germany, Greece, Netherlands, Russian Federation, Switzerland and United Kingdom. Public health, innovation and intellectual property. Delegates considered the report regarding the programme review of the Global Strategy and Plan of Action on Public Health, Innovation and Intellectual Property, and urged implementation of the recommendations by each relevant stakeholder. Delegates asked the Director-General to report on progress to the World Health Assembly in 2020. Israel. The meeting between WHO/Europe and Israel focused largely on the impending opening of a WHO Country Office in Israel, as well as the country’s role in governing bodies such as the Executive Board. Kazakhstan. Representatives at the meeting discussed Kazakhstan’s role as Vice-Chair of the Seventy-first World Health Assembly and its membership in other governing bodies. The meeting also covered Kazakhstan’s vision for achieving UHC and the interlinkages between UHC and strengthening primary health care. Additionally, participants in the meeting shared a progress update on the organization of the upcoming conference to mark 40 years since the adoption of the Alma-Ata Declaration. Collaboration between Kazakhstan and WHO in the areas of health information systems, digitalization, health systems strengthening and primary health care was further discussed, with Kazakhstan expressing satisfaction with the WHO European Centre for Primary Health Care based in Almaty. Republic of Moldova. The representative from the Ministry of Health, Labour and Social Protection expressed thanks for the critical and strategic support WHO provides to the country and for the efforts and activities of the SEEHN – particularly in helping to address health workforce challenges. He emphasized the Republic of Moldova’s commitment to being an active participant in the SEEHN and its support for the 13th GPW. He and Dr Zsuzsanna Jakab, WHO Regional Director for Europe, also discussed the Republic of Moldova’s contribution to the recent conference on health systems’ response to NCDs in Sitges, Spain, and potential participation in upcoming conferences. United Kingdom. In a meeting with the United Kingdom’s Director General for Global and Public Health, discussion focused on potential areas for collaboration between WHO and the United Kingdom, including surveillance, the SDGs and NCDs, among others. Governance issues and the GPW were also raised during the meeting. European Region countries took part in a number of side events on 22–23 May, including on the themes of: pandemic preparedness to protect Health for All; taking civil society engagement to new heights to advance the 13th GPW; towards universal coverage with HIV prevention services and commodities; and more. A technical briefing brought primary health practitioners, ministers and representatives of the international health community together to consider how primary health care contributes to UHC. Dr Jakab spoke for many when she emphasized that while the values set down in the Alma-Ata Declaration on primary health care of 1978 – equity and the right to health – remain as relevant as ever today, renewed emphasis must be placed on acting on these values, and taking account of the modern context. How do we revitalize primary health care to make it relevant today and for future generations? At an interactive discussion event , 4 distinguished experts – Dr Yelzhan Birtanov, Minister of Health of Kazakhstan; Dr Hans Kluge, Director of the Division of Health Systems and Public Health at WHO/Europe; Ms Vidhya Ganesh, Deputy Director of the United Nations Children’s Fund (UNICEF) Programme Division; and Dr Edward Kelley, Director, Service Delivery and Safety at WHO headquarters – shared their thoughts on the legacy of the Alma-Ata Declaration, their vision for primary health care, and encouraged widespread participation, particularly from young people, at the Global Conference on Primary Health Care, taking place in Astana, Kazakhstan on 25–26 October 2018. Dr Jakab, the Minister of Health of Romania, and the WHO Representative in Romania participated in this briefing, which aimed to give Member States an opportunity to better understand the vital role and added value of WHO country offices, using Romania as an example. A total of 22 countries took part in the event and were given an opportunity to gain a deeper understanding of WHO’s activities and collaboration at the country level. Countries also commented on the usefulness of the country visits that WHO/Europe has been conducting since February with European Region members of the Executive Board and members of the Standing Committee of the Regional Committee for Europe. The Seventy-first World Health Assembly continues through 26 May 2018.